The Slim's River West trail takes two days to complete; one day in, and one day out. 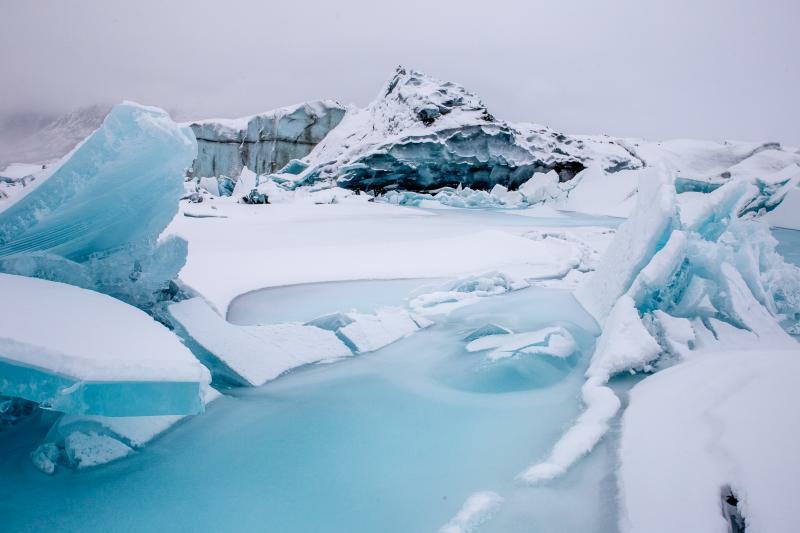 But if you are going through all the trouble of walking all the way to the toe of the Kaskawulsh Glacier, you might as well spend at least one more day exploring near it. 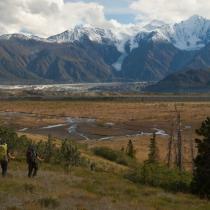 You can hike to the toe of the glacier, or up Observation Mountain to an expansive view overlooking the glacier. Or both! You will have to decide ahead of time how many days you are going to be camping, and then register with Park Canada. Overnight registration is mandatory in the park and so are bear-resistant food canisters, which you can rent from the park. 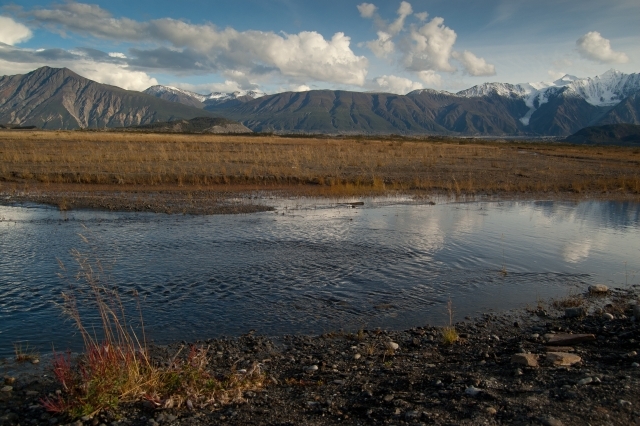 For more information, visit the Parks Canada Kluane registration page or the Parks Canada Visitor Center in Haines Junction. Hiking up Observation Mountain makes for a long day, but is worth the effort. Expect 8-10 hours for the 22 km day hike, and 840 m of elevation gain. 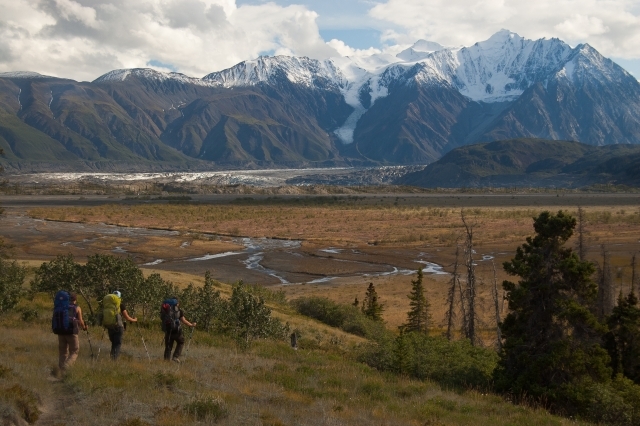 To hike to the toe of the Kaskawulsh Glacier instead, expect about 3-4 hours, which allows for time to explore. The trail passes through a gate and follows an old road which is wide and easy to follow. After 2 kms you will come to your first creek crossing, Sheep Creek. Try crossing towards your right (upstream), near the cliffs. You may even find a log across the creek and may not even need to take your boots off. Otherwise, prepare for the creek crossing. Continue following the old road past the Bullion Plateau information plaque. 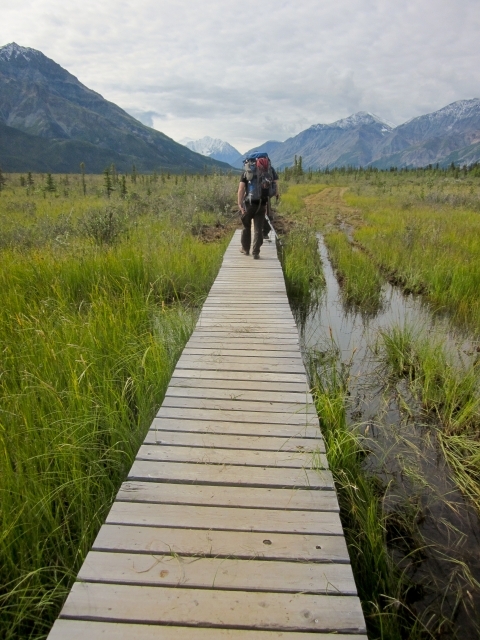 A boardwalk will then lead you across a marshy area. Unfortunately, the boardwalk stops quite short of the end of the marsh, so you will get your boots wet regardless. 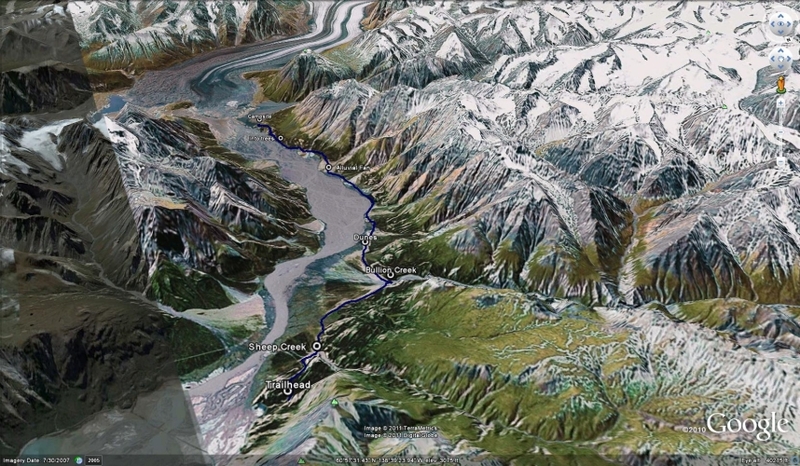 The next landmark is Bullion Creek at about the 6 km mark. Bullion Creek is a little larger than Sheep Creek and can be crossed towards your right (upstream), where the remains of cemented logs posts can be seen on the other side of the creek. During really high water levels, sometimes you have to go downstream to where the creek is more braided to safely cross. After Bullion Creek, the trail disappears for a few hundred meters, but if you stay roughly in the center of the open area, you should come across the trail eventually. 2.3 kms after Bullion Creek you will come across some sand dunes. Camping is prohibited before Bullion Creek and is not recommended at the sand dunes either (it is a special preservation area). Your route for the next 7 kms will depend on how wet the ground is. 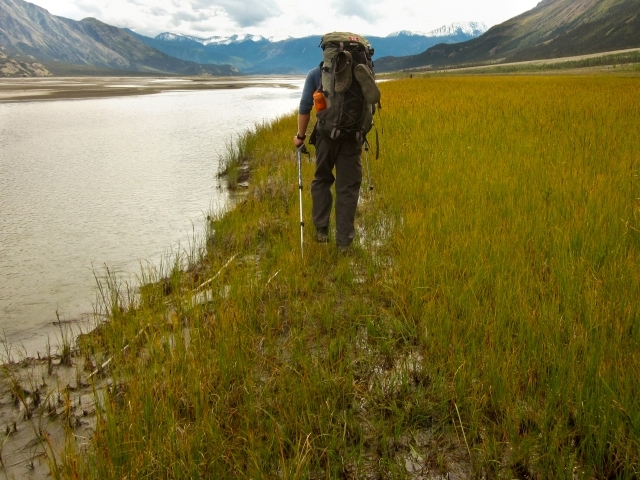 If the mud flats are fairly dry, then this is the easiest route to take. Otherwise, you may have to take detours in the trees towards the mountainside, but this will add up to 2 extra hours. Try the mud flats, and if you start to sink, turn around and detour. 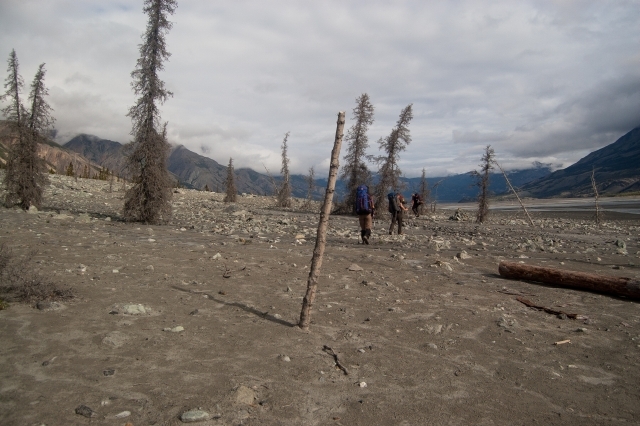 Around kilometer 16 of the trail you will come to an alluvial fan (a wide creek delta of rocks and boulders). 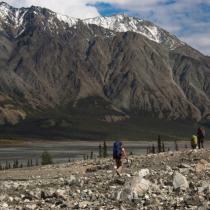 Follow the cairns (piles of rocks used as markers) to pick your way across the fan. Afterwards, you will encounter more marshy areas which you will again have to decide if you can walk through them or if you have to detour up into the trees. 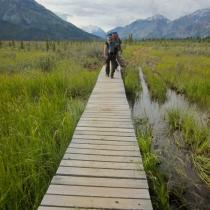 The detours always take longer, so if the marshes are not too wet, try and walk through them. After 20 kms you will leave the side of the river and follow a path into the trees. The path meanders up and down and will also climb steeply for a short while. 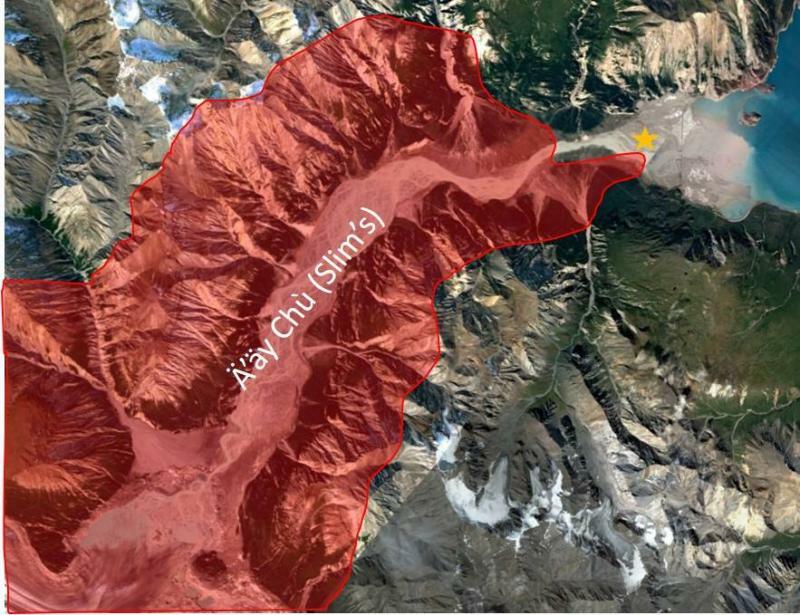 The views will start to open up after a while and you can see the toe of the Kaskawulsh Glacier is getting much closer. It is 2.5 kms through the trees to the campsite. At the campsite, there is a fire-pit with benches, an outhouse, and tenting areas. There is a nice clear stream near the campsite where you can get fresh water (not the little stream a couple meters from the fire-pit, but a little further down the path). 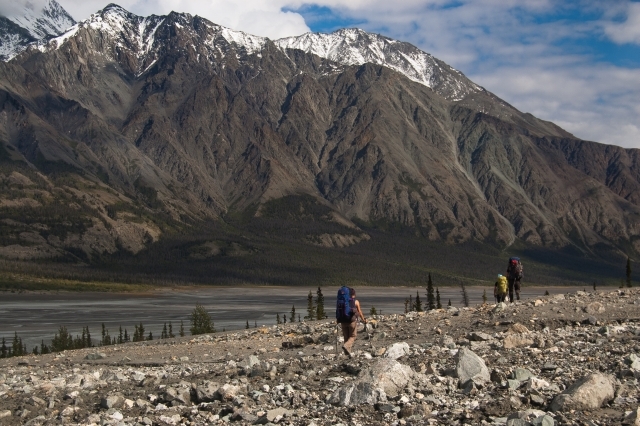 This area is well known for the amount of grizzly bears around, so keep your food and smelly items in a Parks Canada approved, bear-resistant food canister away from tent (these are required by Parks in the backcountry), such as down by the fire-pit. Have you been to Slim's River West lately? Decided to give this a crack given the more challenging winter conditions and the minimal elevation gain here. We bought snowshoes along, which was definitely a good choice as most of the trail was snow covered. We followed the river plain for most of the way as it was frozen. Ended up being a long slog with the jut of land with the campsite not looking much closer for 20kms, maybe taking trail would have been a bit more interesting. Kuskawulsh Glacier was spectacular though! Spent two and a half days in total. Did this trail this weekend - great flat hike with nice spots along the way to camp if you don't want to hike to the campground in one day. Sheep creek was easy to cross (ankle level), Bullion creek was deeper (thigh depth - see picture) but it's only over a few meters and it's possible to find shallower spots to cross if you walk down the creek towards the Slim River. Gear "must" for this hike are: creek crossing shoes (ideally better than Crocs!! 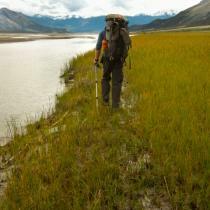 ), hiking poles (to stabilize yourself as you cross Bullion creek) and gaiters (for some muddy stretch along the way). 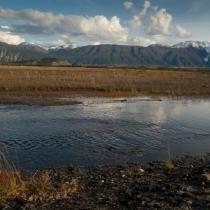 Campground by the glacier has great views and fantastic landscape. Did this trail over August long weekend (discovery day). Really busy weekend with 20+ people in an out. 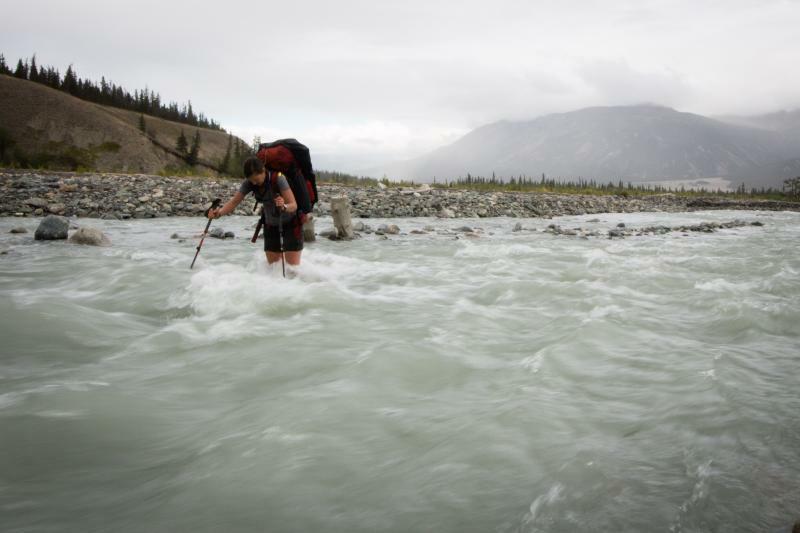 THe hike is pretty easy, with the low water levels, you can cut a lot of time by navigating a path over the flats - in, it took 5h40m and out 4h45m - Tough part is the weight with the bear cannisters. It's beautiful hike. Saw 1 juvenile grizzly on way in but otherwise with so many people, was a pretty uneventful wildlife spotting. The last bit of the trail is a killer once you have been hiking for a few hours with a heavy backpack! This trail is currently CLOSED (as of June 28th, 2017). 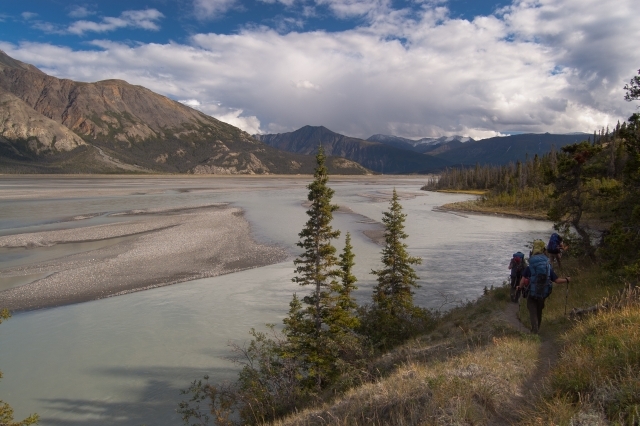 Check the Parks Canada website (http://www.pc.gc.ca/apps/scond/Rec_Rep_e.asp?opark=100252), social media accounts, or call 867-634-7250 for more information. I hiked this trail on June 3rd 2017. Waited for the rain to stop and got a late afternoon start. Followed the Slim's West trail as described. Trail is easy to follow and the 2 creek crossing were straight forward. Creek near campground had little water so I hiked to Canada creek for better water. Woke up early next morning and went up to Observation sub-peak then walked out to the trailhead. My feet had taken a bit of a beating so I decided to hike out in my crocs. Since the water level was so low, I opted to hike straight towards Sheep mountain in the middle of the drainage: Slims Central. This does involve more fords but with crocs on and low water level, the allowed me to save a bit of distance and time and made for a nice direct return trip with the added cooling benefit of multiple river ford on a hot afternoon. One thing we realized was probably missing from our packs were tensor bandages as we realized it might be really easy to roll an ankle especially in the alluvial fan areas. We also realized that just because it looks like water on the map, doesn’t mean you’ll be able to fill your water bottles from it and to fill them when we could. We used coffee filters and a LifeStraw for our water supply and filled up both at Bullion Creek as well as one unnamed water flow along the way again and then also with some very clear (no silt) water at Canada Creek area. 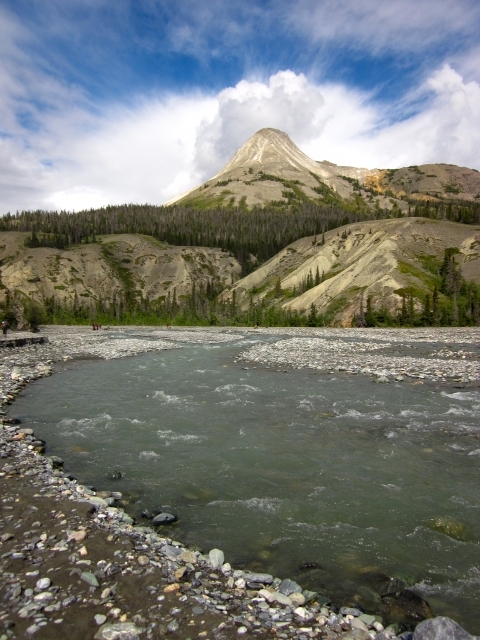 We did our first back-country camping with this hike so we planned to do out one day to the Canada Creek roughed-in campground and then return the next day. We did have a contingency plan that on our return, if the creek levels should be too high, we had enough meals and a plan to stay at Bullion Creek if we couldn't make it. We left the trailhead shortly before 11am arriving at Bullion some time before 1pm. We had no problems crossing at this time, we removed our pants and crossed with water shoes and used the tripod system with the second person (myself, the smaller traveler) behind the larger/stronger crosser. We had our dog with us also who is not really a swimmer so we put him on a harness and a rope in case he decided not to follow, then we could 'encourage' him across. We made it with no problem on our way through. We left our water shoes on a post to retrieve them on our return. 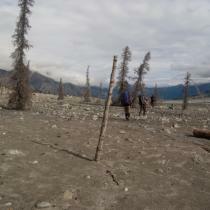 It took us 7 hours to complete the 22.5 km hike out to Canada Creek/designated camping area. We are fairly experienced hikers but not with large packs but that meant we averaged around 3kms/hr which we thought was not bad for our first time. There were no further creek crossings that posed a problem on day 1 however, it is of note that you will cross several marshy/quite wet areas that cannot be avoided. We'd recommend waterproof boots and gaiters especially in cooler season - we were fine since we had two quite warm days. On our travels out, we followed the trail to its design, following along each alluvial fan and letting the cairns guide us through the open areas and following the trail up into the wooded areas which made for quite a bit of extra exertion. On our return trip we would cut out somewhere around km 20 and cut down to the Slim's River area (now mostly dry riverbed) and didn't rejoin the trail again until km 12 or so. Keep in mind to always watch where the pooled water remains so that you don't end up very far from the shore and unable to reconnect. Some benefits to this return hike are that the effort exerted is not great and also, there is great visibility for bears. When we were in the woods, we made a lot of noise since there were many blind corners and it would have been easy for a bear to surprise us. Some disadvantages were that it was quite windy and there was sand blowing towards us, (thank goodness the wind was from our backs), you are in full sunlight and also, there is quick mud here and so the ground that you step on is not always solid and it can be unnerving. All in all, we appreciated the easier hike on the way back. When we arrived back at Bullion Creek around 4pm on Day 2, the creek looked much faster and seemed deeper. My partner decided he’d go across with his pack and the dog and leave both on the other side and come back for me. Well the water was just under his hip bones when he went across and he decided to give up on the dog since he lost his balance and fell to all fours. Thankfully not much got wet and he was fine but then he and parts of our tent were on the other side so he had to make the trek back again or we’d be apart and both without proper shelter. He made it a little more succesfully but we decided that if it was that high on him, it would be even further up on me and I’d likely wash down the creek. We decided to make camp for the night and eventually another couple joined us also. We woke up around 6:30 in the morning and started crossing around 7:30am and the levels were much lower and much safer and all four people and one dog made it across with no problems. (we all waited to cross together for extra safety) There is a little fire pit area against a rock wall if you walk up the creek against the direction of the current in case you are cold/get gear wet but there are not a lot of places for wood. We found enough wood to keep us warm and left our bear bins in that area overnight. All in all, we loved the hike, we’re glad we brought extra food and would strongly recommend it to others. We attempted this trail at the end of July. There had been quite a lot of rain in the days before we got there. 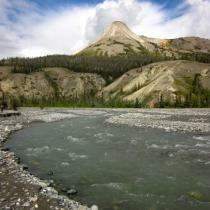 Parks Canada staff warned us that Bullion Creek was high, and that many people had turned backed. They even had to initiate search and rescue the previous day because one group had not returned when expected. Luckily they were quickly located; they had been stuck on the other side of Bullion Creek, unable to cross due to high water levels. We decided we'd go take a look and figure out what to do when we got there. Parks staff suggested that water levels would be lowest between 2am and 7am, so we began our hike around 6am, as it is not too far to Bullion Creek from the trailhead. Sheep creek was easy to cross, so we were feeling optimistic. When we arrived at Bullion, a couple were just putting their pants back on having successfully made it across. This also gave us hope that we could make it! We spent some time walking up and down, looking for a good spot. It all looked very deep, and the current strong and fast. We figured that the other couple had made it, so we started crossing close to where they had. After side-stepping just a few feet across, the water was above our knees (we're both tall), and the current extremely strong and fast. It looked to be deeper on the far side. I felt unable to keep both feet firmly on the creek bed as I fought the current, so we retreated back to where we had started. 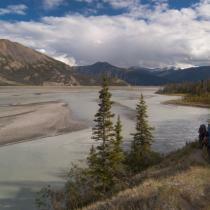 We then walked about 1km down stream (which included some decent bush-wacking in a Grizzly-bear buffet of berry bushes! ), to see if we could find some braiding and shallower waters. We thought it looked better so made another attempt, but it still didn't feel right. It was a hard and disappointing decision, but we didn't think it was safe to continue, so we headed back. Upon returning to the parks office we were told that a girl had nearly drowned trying to cross a creek on another trail the day before. We were also told that a man died trying to cross Canada Creek on the Slim's River just last year. I'm not trying to scare people, but just know your strengths and limitations. We are not very experienced with creek crossings, so we felt it was the right thing to stop when we did (as much as we didn't want to!). Just be aware that the water levels can be high at Bullion Creek if there has been rain. A parks staff member also mentioned that one man had been able to find a better way across by continuing to bushwhack another km down stream from where we had stopped. So it might be worth trying a big detour downstream if water levels are high. Thinking of skiing the slims river west trail over Easter...anyone have any trail reports or know if there is a trail broken?